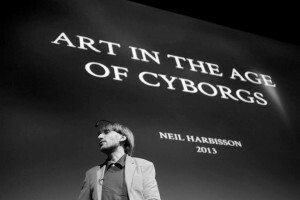 As the world’s first cyborg, Neil Harbisson hears color instead of seeing it via a camera attached to an antenna which leads to a chip implanted in his skull. Being born with achromatopsia, he is completely color blind and only sees in grayscale. Living in a world without color was difficult yet it did not stop him from pursuing art education along with music. As a color hearing cyborg, his art mixes up the senses of sight and sound, producing portraits you can hear and colorful artwork based on sound. In part 4 of our series on Neil Harbisson, we interviewed Harbisson about what it was like being color blind in art school and how he now paints with sound. Munsell: Being color blind, how did you deal with learning color theory in your art classes in college? NH: I studied art, visual art and there was this subject of colour theory and to me, it was studying a religion because it’s invisible. So I have to believe the colour existed but I really, sometimes it really felt that it didn’t, and the people just believe and treat colour and worship colour so much that it felt a lot like something more than physical, something religious. And I felt like I was some kind of… priest or something studying this, because when you ask what is blue or what is red, people start using these words, it feels like they’re talking about something supernatural. It doesn’t make sense when people talk about what colour is. 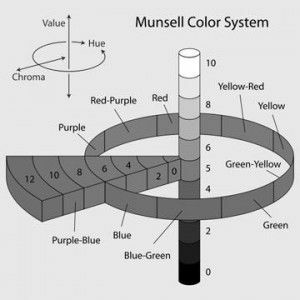 The Munsell Color System… without color! 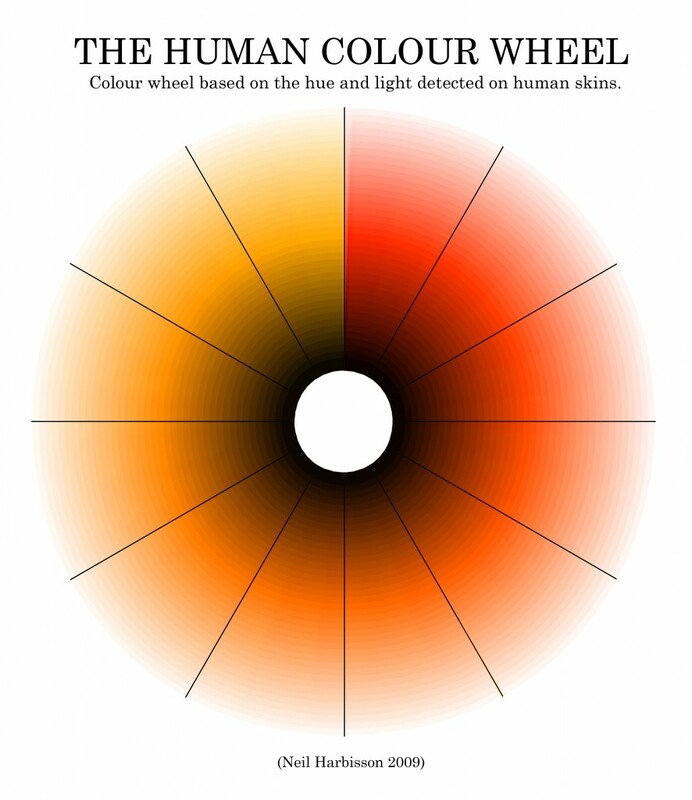 Munsell: So how does a colorblind art student actually learn the subject of color theory in school? Did you ever have to do a test arranging colors by hue order? Can you actually pass a color theory test and just figure it call out without being able to see any of the colors? NH: Yes, because you learn the names of the colour. I think they gave us different blocks and we had to arrange them from black to white. I think it was boring for all of us [laughs]. But I do realize that I have much more practice in differentiating lightness than most people. So if you see hue and saturation then light is a bit less important. So seeing only light means that I can differentiate very subtle differences of light. Could you pass a color vision test if you could only see in grayscale? Harbisson creates works of art or sound based on the relationship between color and sound as well as people and colors. His sound portraits are based on the colors of the face of the person he’s looking at, writing down the different notes and combining them into a micro tone chord. He’s done sound portraits of many famous people, including Prince Charles, Woody Allen, James Cameron, Al Gore, Judy Dench, Leonardo DiCaprio, Nicole Kidman, Steve Wozniakk and others. He’s created a color wheel based on the hue and light of human skins, and in City Colours, he visited the capital cities of more than 50 countries and selected two main hues for each city. His Colour Scores are representations in colors of the first 100 notes of well-known musical compositions or famous speeches. So in his works visual colors become musical sounds and musical scores becomes colorful art. Munsell: Instead of what you did by mapping the sounds of, for example, Martin Luther King’s speech, to colors in your artwork, what if you took those colors within the palette of the speech and then you are constricted to those colors to create a photo-realistic portrait of the person? We wonder what types of interesting results you could get with those palettes and if it would be in the style of a pop art piece. NH: Yeah, I think the style can be any, just as long as it follows the colour to sound to me. As long as it’s as pure as possible, the connection between the colour and the sound, then you can do anything. I like to be as cold as possible when it comes to transposing colour to sound. But I think, now, I might start exploring more expressive ways of using colour as sounds. Munsell: Do you ever take the sounds and go back into painting art with it? NH: No, not physically. But maybe with glitch art – you can use a sound file and then modify it so it becomes colour. So you can do this digitally. Physically, I would need a studio and a space and I think this is one of the aims, why we want to stay in New York for a long period, is to create actual things with paint. So this might be happening soon. Munsell: So if you look at someone’s face and you write down the sounds of the colors of their face, are you actually writing notes, because there are all those microtones in between. How do you write those notes? NH: I write either the number of the frequency – a number. Or for example, F sharp plus 13. So I have 30 between F and F sharp. Munsell: So you have memorized it so well that you know immediately what note it is when you hear it? NH: Yes. I usually hear more than one, so it maybe goes from F plus 10 to F plus 13 and then it keeps moving, because, depending on the light, it’s…colour is not consistent. It keeps varying. So then I choose the one in the middle it also depends on the place – because then I have to subtract the sound of the light, which is important. Because if I do a sound portrait in here, it sounds different than if I do it outside, because the colour of the skin will vary a little bit, depending on the light. Yeah, so each sound portrait has a date, and a place, because the context is important — where the pictures been taken. 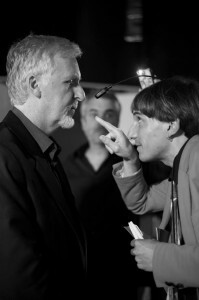 Our interviews with Neil Harbisson will continue with Part 5: Beyond Hearing Color. For the first post of this series, as well as links to future posts about Harbisson, read Neil Harbisson – Part 1: Rearranging the Senses of Color Sight and Sound.